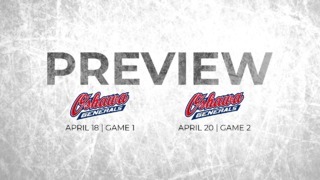 It was against a rested Saginaw Spirit that the Ottawa 67’s played the final game of a three in three weekend, on Military Appreciation day, in a game that ended 5-3 in favour of the Barber Poles. Lucas Chiodo, Tye Felhaber, Sasha Chmelevski, birthday boy Mitchell Hoelscher and Marco Rossi all scored for Ottawa, while Cedrick Andree made 33 saves in his second consecutive start. The Spirit came out flying opening the score at 2:52 in the first period. Lucas Chiodo would tie things up in the dying minutes of the period, finishing off a sweet setup from Hudson Wilson to send both teams to the locker rooms with a tied score of 1-1. The second period was held scoreless by the solid play of both goaltenders Cedrick Andree and Ivan Prosvetov. After two periods, Andree had stopped 23 of the 24 shots Saginaw had thrown on net. A day after hitting the 50 goal mark, Tye Felhaber stayed hot, finding the back of the net on the power play for his 51st goal in 48 games. Chmelevski, Hoelscher and Rossi would all join the party with goals of their own before Saginaw finished the game off strong with two quick goals from Ryan McLeod and Cole Coskey near the end of the game. But it was too little too late for the visitors. 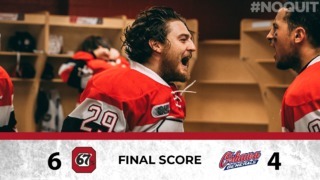 After this win, the Barber Poles have now won their past five games and eight out of their last ten, which has helped them keep a four-point lead over the London Knights in the overall OHL standings. 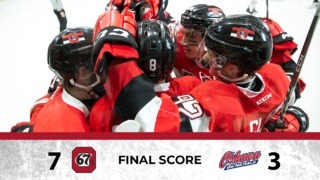 The 67’s will be back on the ice as soon as Wednesday when the Kingston Frontenacs will be visiting The Arena at TD Place to face the 67’s at 7:00 PM. Mitchell Hoelscher is now riding a four-game point streak, in which he has put up 6 points. The OHL’s top five players in the +/- category are all 67’s. Tye Felhaber (+44), Austen Keating (+43), Marco Rossi (+36), Merrick Rippon (+35) and Kevin Bahl (+31) are the five league leaders in this category. Kyle Maksimovich now has 7 points in his last 3 games.